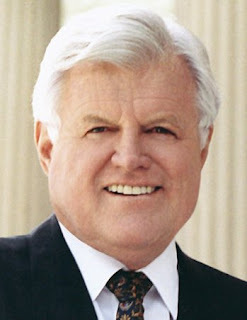 For over a generation there has been a Kennedy at the forefront of of US Politics but sadly yesterday that era came to an end with the passing of Sen. Edward "Ted" Kennedy 77, from a brain tumour. Like many conservatives, I regarded most* of his political views with utter disdain, and so I find it hard to discuss my true feelings about the "Liberal Lion" of the Senate. That said; despite his backward views, a multitude of personal tragedies and questionable transgressions, I recognise his status as a political icon. I'm positive that he will be missed and remembered not only in the US but here in Ireland too. In 2006, Time magazine named him as one of America's "Ten Best Senators", saying that he had "amassed a titanic record of legislation affecting the lives of virtually every man, woman and child in the country" but as far as this island goes he will be remembered as both the madman who staunchly supported Irish Republicanism in the 70's, once calling for British troops to leave Northern Ireland, but more recently, one of the political heroes of the peace process leading to the Good Friday Agreement in 1998. One of our own prominent politicians Micheál Martin TD said today: "He knew and loved Ireland - it's people, it's music and its culture. As the embodiment of the Irish immigrant story, his special dedication to the peace process was unrivalled and deeply held." 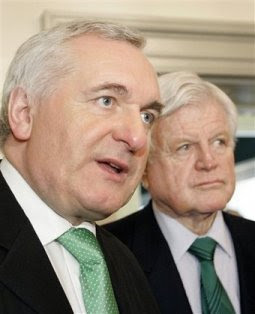 Tributes were also seen and heard from An Taoiseach Brian Cowan, former foreign affairs minister Peter Barry and Ambassador Dan Rooney but it was the words of our greatest living former leader Bertie Ahern that resonate most: "it is Ted Kennedy’s great achievement that his own life transcended tragedy and not only emulated but surpassed the achievement of his brothers who he revered. The causes, for which he stood, civil rights, health care, immigrant workers and Ireland, are all immensely endowed because of the decades of unstinting effort, political skill and campaigning zeal which he dedicated his life to." Sen. Kennedy will lie in repose Thursday and Friday at the John F. Kennedy Presidential Library and Museum in Boston and will be buried Saturday near his brothers at Arlington National Cemetery, Arlington Va.